Explain historical patterns and trends of unemployment in the U.S.
Let’s look at how unemployment rates have changed over time and how various groups of people are affected by unemployment differently. Figure 1 shows the historical pattern of U.S. unemployment since 1948. While it clearly fluctuates over time, the unemployment rate seems to return to a range of 4% to 6%. There does not seem to be a long-term trend toward the rate moving generally higher or generally lower. Figure 1. The U.S. Unemployment Rate, 1948–2016. The U.S. unemployment rate moves up and down as the economy moves in and out of recessions. (Source: www.census.gov/cps). Unemployment rates in the late 1990s and into the mid-2000s were rather low by historical standards. The unemployment rate was below 5% from 1997 to 2000 and near 5% during almost all of 2006–2007. The previous time unemployment had been less than 5% for three consecutive years was three decades earlier, from 1968 to 1970. It has returned to this level in 2016. Figure 2. Unemployment Rate by Demographic Group. 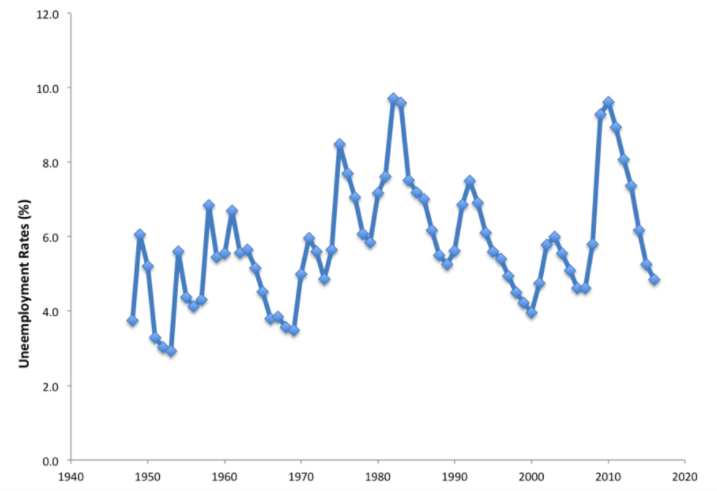 (a) By gender, 1972–2012. Unemployment rates for men used to be lower than unemployment rates for women, but in recent decades, the two rates have been very close, often with the unemployment rate for men somewhat higher. (b) By age, 1972–2012. Unemployment rates are highest for the very young and become lower with age. (c) By race and ethnicity, 1972–2012. Although unemployment rates for all groups tend to rise and fall together, the unemployment rate for whites has been lower than the unemployment rate for blacks and Hispanics in recent decades. (Source: www.census.gov/bls). The unemployment rate for women had historically tended to be higher than the unemployment rate for men, perhaps reflecting the historical pattern that women were seen as “secondary” earners. By about 1980, however, the unemployment rate for women was essentially the same as that for men, as shown in 2(a). During the recession of 2008–2009, however, the unemployment rate climbed higher for men than for women. Read this BLS report for detailed information on the recession of 2008–2009. It also provides some very useful information on the statistics of unemployment. Younger workers tend to have higher unemployment, while middle-aged workers tend to have lower unemployment, probably because the middle-aged workers feel the responsibility of needing to have a job more heavily, in addition to having more experience. Younger workers move in and out of jobs (and in and out of the labor force) more easily. Elderly workers have extremely low rates of unemployment, because those who do not have jobs often exit the labor force by retiring, and thus are not counted in the unemployment statistics. Figure 2(b) shows unemployment rates for women divided by age; the pattern for men is similar. The unemployment rate for African-Americans is substantially higher than the rate for other racial or ethnic groups, a fact that surely reflects, to some extent, a pattern of discrimination that has constrained blacks’ labor market opportunities. 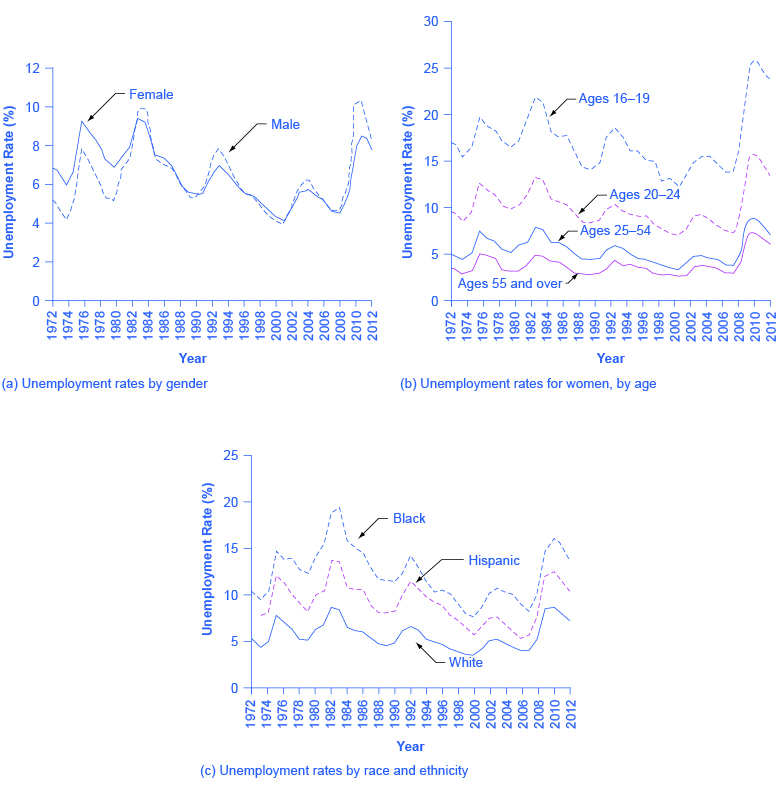 However, the gaps between unemployment rates for whites and for blacks and Hispanics diminished in the 1990s, as shown in Figure 3(c). In fact, unemployment rates for blacks and Hispanics were at the lowest levels for several decades in the mid-2000s before rising during the recent Great Recession. Finally, those with less education typically suffer higher unemployment. In early 2013, for example, the unemployment rate for those with a college degree was 3.7%; for those with some college but not a four-year degree, the unemployment rate was 6.0%; for high school graduates with no additional degree, the unemployment rate was 7.6%; and for those without a high school diploma, the unemployment rate was 10.3%. This pattern may arise because additional education offers better connections to the labor market and higher demand, or it may occur because the labor market opportunities for low-skilled workers are less attractive than the opportunities for the more highly-skilled. Because of lower pay, low-skilled workers may be less motivated to find jobs. The Bureau of Labor Statistics also gives information about the reasons for being unemployed as well as the length of time individuals have been unemployed. Table 1, for example, shows the four reasons for being unemployed and the percentages of the unemployed that fall into each category. Table 2 shows the length of unemployment. Just for fun, watch this Ted talk on the impact of droids on the labor market and what that means for the way we think about jobs. From an international perspective, the U.S. unemployment rate typically has looked a little better than average. Table 3 compares unemployment rates for 1991, 1996, 2001, 2006 (just before the recession), and 2011 (somewhat after the recession) from several other high-income countries.